Hello, do you love Kirby but hate your cat? 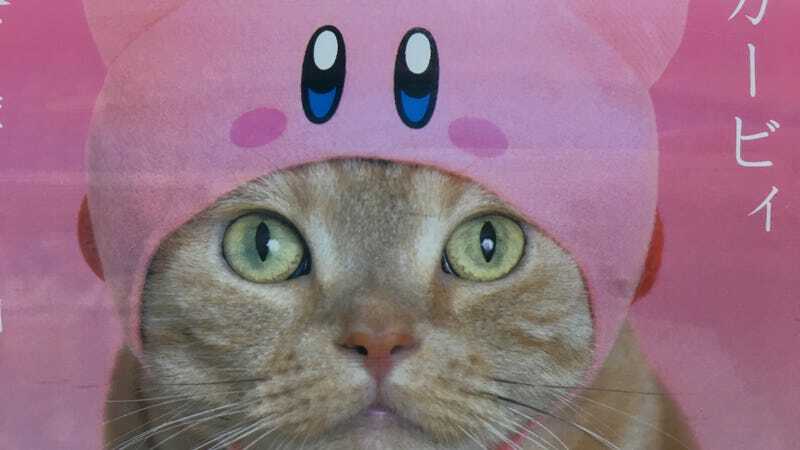 Now you can shove your cat’s head into a Kirby-shaped hat, thanks to the miracle of Japanese vending machines. The hats, which your cat is guaranteed to wear for at least three and a half seconds before desperately trying to claw it off, are available in five different varieties. Since they’re only sold in gacha machines, you have to just drop in your 400 yen (about $4) and hope that you get a good one and don’t have to dress up your cat like King Dedede. You will notice that not even the professional model cats that they hired to sell this product can keep the visible disdain off of their faces. For purposes of fully committing to this story, I bought a hat. It’s Kirby! Now all I need to do is find a cat who needs to be taken down a peg.